Are you OK with sailing jargon, or does it leave you adrift in a sea of confusion? Perhaps you're a rugged old seadog who is fluent in seafaring-speak. Port ~ The left hand side of a vessel when facing the bow. Also a safe haven as in 'any port in a storm'. Port Tack ~ A boat is on the port tack when the wind strikes the port side first and the boom is over to the starboard side. Port Side to ~ Placing the port side of the vessel against a quay or pontoon. Position Line ~ A line drawn on a chart as a result of having taken a bearing, along which a boat's position must lie. Two postion lines fix the boat's location at the point at which they intersect. Pounding ~ The action of the seas 'pounding' on the underside of the hull or bridgedeck. Also known as 'slamming'. 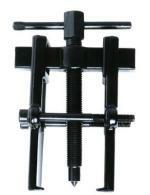 Preventer ~ A line rigged forward to secure the boom in position, thereby preventing a highly dangerous accidental gybe. With the jib poled out and the mainsail set on the otherside as shown in the sketch - 'goose-winging' - a jibe preventer should always be used. Privileged Vessel ~ The boat that has right of way, the other boat being the burdened vessel. Prodder ~ Another piece of sailing jargon, an alternative word for bowsprit. Pulpit ~ The tubular steel structure at the bow. Pushpit ~ A pulpit at the stern. Quarter ~ The section of a boat, either port or starboard, that is between midships and the stern. Rake ~ The angle by which the mast is off-vertical in the fore-and-aft plane. Range ~ (1) Distance from a fixed point. (2) The rise of tide. (3) The distance at which a light may be seen. Rating ~ A category resulting from the measurement of a sailboat which enables it to take part in handicap races. Reach ~ See 'close reach', 'beam reach' and 'broad reach'. Ready About ~ Sailing jargon given as the order to ready the boat for tacking. Roller reefing the mainsail, either around a spa inside the boom or inside the mast as shown here. Reeve ~ To pass a line through a block. Rhumb Line ~ A straight line drawn on a chart between two points. This is only the shortest distance if it runs along the equator or a meridian. RIB (or RHIB) ~ A Rigid Inflatable Boat - or Rigid Hulled Inflatable Boat. Usually a small powerboat. Riding Light ~ Another name for the anchor light, which is an all-round white light normally shown at the masthead on a sailboat to indicate that is less than 50 feet over all and is at anchor. Rig ~ The boat’s arragement of sails and spars. Rode ~ The rope or chain (or a combination of both) that connects a vessel to its anchor. 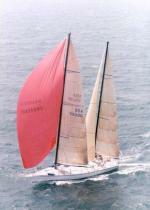 Roller Reefing ~ A mechanism to reduce sail by winding it up around a small diameter spar – usually of aluminium. Rudder post ~ The rudder shaft or stock. Rules of the Road ~ International rules and regulations regarding conduct and priorities of boats in close proximity to each other. Runabout ~ A small, open motorboat. Running ~ Sailing downwind – i.e. with the wind coming from astern. Running Lights ~ Fixed lights on boats to be shown during the hours of darkness. Running Backstay ~ A backstay that can be slackened or tautened, as required, and can be done with tackles, winches or with a Highfield lever.